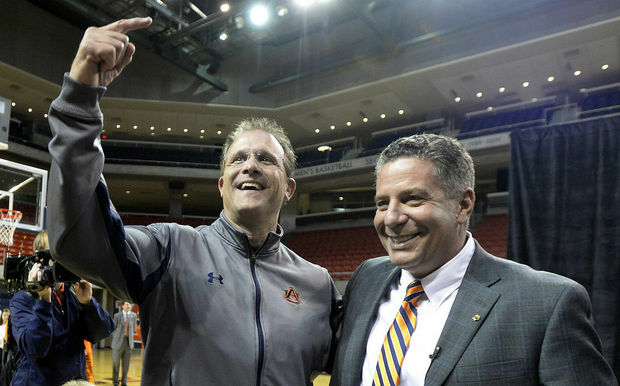 It took Bruce Pearl less than two minutes to point out Gus Malzahn at Tuesday night’s press conference in Auburn Arena introducing him as Auburn’s new basketball coach . It took him 17 minutes to get around to his wife. In between he talked about his son, his assistants and the need to have your family with you in life. “Chances are you’re going to see me with my clothes on most of the time,” Pearl said, but that wasn’t the highlight of the night for a man seemingly full of highlights. People keep asking — Is this real? Because right now, everything seems like a highlight from someone else’s dream. When you listened to the gathered crowd sing him Happy Birthday, it was easy to wonder. Is this real? You could wonder, when he feigned a bit of “Aww shucks” and then directed the singalong before saying “How about if we make a deal? How about if we celebrate my birthday at the tournament next year?” It was easy to wonder. Is this real? And when Jay Jacobs, caught up in the spirit of the thing, took a shot at the media, it was easy to wonder. When the crowd chanted for Gus, and you realized: these might be high water times in the athletic department, you could wonder, is this real? As he talked about how he has found “this part of the country to be a part of the country that offers grace,” you might have found a different side to the high-energy, enthusiastic, Personality of Pearl. It is hard to imagine Sonny Smith or Tommy Joe Eagles or Cliff Ellis running into a thundering mass of students and fans on the airport tarmac. 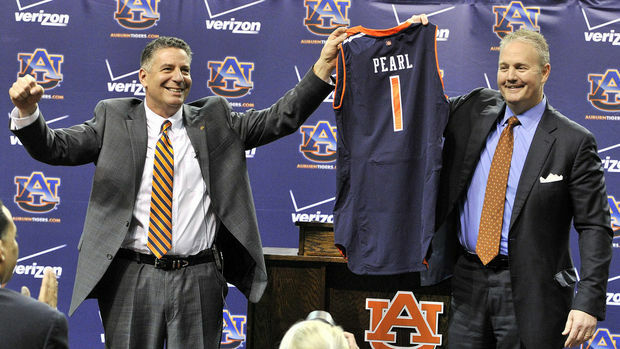 But Bruce Pearl is saying to anyone who will listen that he is grateful and that he has been humbled. To Auburn folks, that seems real. And you remember: Auburn loves a comeback. And they’ve got their next feature performer. That’s real. Kenny graduated from Auburn at the turn of the century. He worked in newsrooms across the region and then earned a master’s degree at UAB. He met and married a Yankee, who declared her Auburn allegiance at her first home game. She’s now on the faculty at Auburn. He’s finishing his PhD at Alabama and teaches at Samford University. And he’s an assistant editor at The War Eagle Reader. See him online at www.kennysmith.org and @kennysmith. Related: ‘They could dominate Alabama’: ‘Pardon The Interruption’ says Bruce Pearl great fit for Auburn basketball.